Now another, but already known controversy over the Internet giant has raised many concerns over privacy of users who carry their smartphones with them. We all have sensors in our pockets that track us everywhere we go i.e. Smartphones. Today, with the help of these sensors, Google is tracking our every foot steps and placing a red dot on its map to keep track of users’ records, Junkee.com reports. “You can yourself check your every move from here. You just need to log in with the same account you use on your Smartphone, that’s it. The map will display all the records of everywhere you've been for the last day to month on your screen,” Elizabeth Flux, editor of Voiceworks magazine wrote. 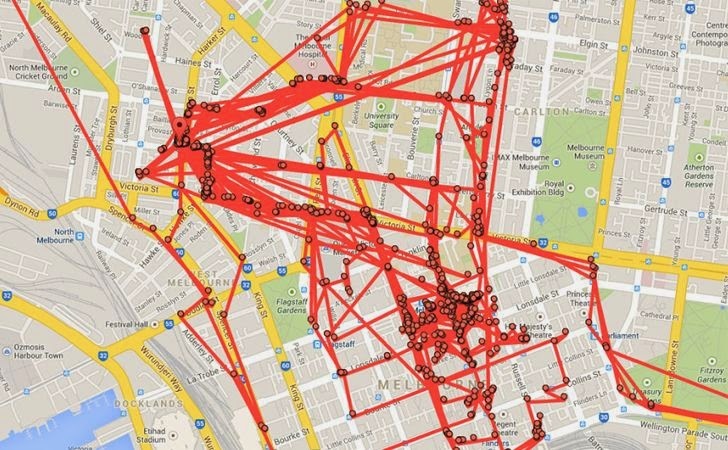 You can check your Google Location History Here. Location is one of the most sensitive elements in everyone’s life. Where people go in the evening, at vacations - every data is a part of one’s private life and the existence of that data creates a real threat to privacy. The absence of notifying users only means an ignorance to the privacy of users. However, your records goes to the Google Location History only if you have enabled ‘location services’ in your smartphone devices. If you have disabled this service in your phone then you will find no location data on the map. Infact, if users disable their devices’ location service, apparently it somehow go switched back ON, if in case, any app wants access to their GPS location. So, it’s quite difficult to remain at the safer track. In 2009, MPs criticized the Internet giant Google for its "Latitude" system, which allowed people to enable their mobile to give out details of their location to trusted contacts. At the time MPs said that Latitude "could substantially endanger user privacy", but Google pointed out that users had to specifically choose to make their data available. Google tracks on users, long been said, for the purpose of targeted advertisements. But tracking opens the door to surveillance not only by advertisers but governments as well. Many third parties already track smartphones and tablets location by picking up their user data for various purposes, mostly commercial or ad-related. Advertisers and retail stores can record location data about users in order to either serve certain location-related ads, or to better customize store layouts to maximize in-store impulse purchases. But, If Privacy matters you a lot, then turn Off location service or Location History on your device, and better avoid those apps that ask for your location data. To disable the location service, select Settings > Privacy > Location and then untick the box next to Use my location. After former NSA contractor Edward Snowden revealed about the Global Surveillance programs, Privacy has become an important issue for every individual. Despite implementing any ‘privacy’ settings, all our personal information is being collected and stored somewhere.